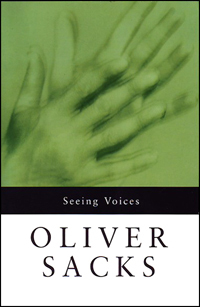 Seeing Voices: A Journey Into the World of the Deaf by Oliver Sacks. New York: HarperCollins, 1989. There’s a reason this book is a classic in the field of Deaf Studies: Sacks weaves together history, linguistics, and a deep understanding of culture to create a compelling introduction to American Sign Language and Deaf culture for the uninitiated. If you are signing with your baby, sometimes it can be hard to gauge your child’s progress since most language development benchmarks tend to focus on spoken language only. The Ontario Infant Hearing Program offers comprehensive lists of developmental milestones from birth to 24 months in both sign language and spoken language on its website here. This is a great tool to help parents and educators learn what to expect from their little signers at various ages! Children can learn to sign long before they have the ability to speak. Using sign language with your baby can reduce frustration for both of you. Your baby can tell you exactly what he wants! Children exposed to sign language early in life will not only find it easy to learn ASL later, they will find it easier to learn ANY language later. Early exposure to language may increase I.Q., social skills, and create deeper bonds between parent and child. Sign language is not only good for your baby, it’s fun! And it’s not just for babies either – keep up the learning as your child begins to speak, and you and your child can develop a second language together. Teach the signs for everyday objects and activities first. Use the objects to reinforce the signs often, until your child begins to sign it back. Remember, they can understand you before they sign it back, so keeping using it. If the child begins to sign back, reward him or her with lots of smiles and hugs and kisses. Be consistent. Make sure you use the same sign each time for the same object. Use your face. 80% of ASL is on your face and body, NOT your hands. The sign “HAPPY” doesn’t mean “happy” unless you’re smiling! Accept your baby’s signing style. Babies won’t always make a sign correctly the first time they sign it, just like they won’t speak a word correctly the first time they speak it. Keep signing it the correct way and your baby will soon learn. Reinforce signs throughout the day to help you both remember them. You can learn signs from books, though videos and live people are usually a lot easier. See the other side of this sheet for great resources to help you both learn. There are lots of places to sign! You can use sign language at home, in the car, at the park, while reading stories. You can also make the signs in different places to help your baby understand. Sometimes sign it on her, on the book, or on yourself. When using signs with your baby, it’s a good idea to use American Sign Language. There’s a big difference between American Sign Language, which is a whole language, and Signed English, which is just a manual code to represent English words. By using ASL, you’re giving your child (and yourself) a chance to learn another language! When Cindy, who is hearing, moves in down the street from Megan, who is deaf, the nine-year-olds quickly become best friends. Megan wears hearing aids and lip-reads, but the girls become even closer as Cindy begins to learn sign language. Problems crop up when her attempts to be helpful offend Megan’s sense of independence, and things get even worse at summer camp, where they meet another deaf girl, Lizzie. Megan can’t wait for her positively purple birthday party, but her perfect plans get derailed when a new girl, Alexis, joins her class and rebuffs Megan’s invitation and brushes off all of Megan’s attempts to be friendly. When Megan teaches Alexis’s autistic brother some basic sign language, it opens up communication with both him and Alexis. Rivalries abound when Megan’s fourth-grade class puts on a production of “The Wizard of Oz” and she has her heart set on playing Dorothy…but so does her friend Lizzie. In the late 19th century, hereditary deafness affected at least 1/5 of the population of Chilmark, a town on Martha’s Vineyard. Among this group is Merry Skiffe, an artistic 12-year-old whose peaceful life unravels when wealthy miser Ned Nickerson is murdered on a dark road one Saturday night and Merry finds herself among the four residents of Chilmark who have no alibi. A 10-year-old boy returns to his parents’ apple farm for the holidays after his first term at a school for the deaf in Philadelphia. Early one morning, when it is still dark, a young boy wakes to his special alarm clock. He puts on his hearing aid and his clothes, then goes to wake his father. Together they walk down to the beach. Jacob cannot hear, so he and his father sign or lipread or just squeeze each other’s hands. This poetic story is beautifully illustrated in glowing watercolors. Tim is taken aback when he learns that his new neighbor is not only a girl, but is also deaf. When he is assigned to work with her to perform a fable at school, he’s nervous – but as he gets to know Maria, their performance of “The Hearing Country Mouse and the Deaf City Mouse” comes together, and they become friends. 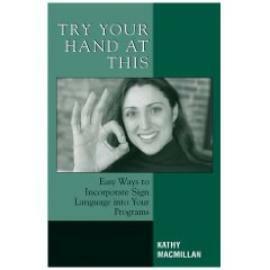 This story introduces some basic sign language as well as information about the technology used by Deaf people. To celebrate the expressiveness of ASL, artist Laura Rankin presents her striking interpretation of the manual alphabet. Here, the hand that signs “V” holds a valentine, “I” points to delicate icicles, and “O” dangles a shining ornament. The acclaimed author of “The Handmade Alphabet” now presents a book that pairs American Sign Language signs for the numbers 1-20, 25, 50, 75, and 100 with beautifully drawn objects. As they make their way through the zoo, a group of children sign and fingerspell the names of the animals. In addition to signing animal names, the telling of time is expressed with the signing of numbers 1–12 in a clocklike shape. Vibrant color photographs depict the action of the story and the signing, while black-and-white insets show the fingerspelling. These excellent picture books incorporate basic sign language instruction into stories of a little boy named Moses, who is deaf. The illustrations are child- friendly and clearly depict the signs, which are related to the story. Of special note is Moses Goes to School, which offers a look at everyday life in a school for the deaf. This unique picture book presents the tale of a deaf printer who, through the use of American Sign Language, is able to communicate with other deaf printers over the roar of the printing presses, and save their hearing counterparts from a fire. In the mid-1800s, Luke and his mother help support themselves by making panoramic eggs of maple sugar. When a man bursts into their home and accuses them of hiding slaves, Luke’s mother denies the charges–although she is planning to meet her contact on the Underground Railroad that very day. With his mother held at home, Luke, who is deaf, must use his resources and creative talents to help make the connection. A perennial favorite, this book offers both colorful illustrations and crisp, full- color photos of deaf actress Linda Bove performing the signs. http://www.sign2me.com Dr. Joseph Garcia’s official website features discussion groups, products, and the latest research showing how signing benefits both deaf and hearing babies. http://www.signingsavvy.com This online video dictionary of signs is clear, accurate, and easy to use. Though the free access is limited to five searches per day, you can access as many signs as you want through the alphabetical index. http://www.signingtime.com/ The online home of the highly recommended “Signing Time” DVD series features downloadable song lyrics, FAQ pages, and lots of activities for kids.